"FARNBOROUGH: For much of the last few years when one thought of electronic warfare, one tended to think of Raytheon. After all, they’re building the Next Generation Jammer, right? BAE Systems would like to change that and is beginning to take a guarded but more public stance. For years, Air Force officials have declined to discuss the electronic warfare and cyber capabilities of the F-35 Joint Strike Fighter for example, which BAE Systems builds. Then the head of Air Combat Command, Gen. Hawk Carlisle, began to publicly mention these capabilities at the Royal International Air Tattoo at RAF Fairford last week. He said the F-35’s EW capabilities are “an order of magnitude better than anything we’ve had in the past.” That, I can tell you, put a smile on the face of at least two BAE employees. Until now, we’ve had little independent insight from the military on the actual performance of the F-35’s EW and cyber capabilities. I know from speaking with a range of Air Force and industry officials over the last two years that a key part of the F-35’s effectiveness derives from the fact it was designed from the get-go to launch both cyber and EW attacks on enemy air defenses, especially the most advanced Russian missile systems such as the S-400. Anything that emits, such as radios, radar and other sources, can be attacked. “Advanced electronic warfare capabilities enable the F-35 to locate and track enemy forces, jam radio frequencies and disrupt attacks with unparalleled precision. All three variants of the F-35 carry active, electronically scanned array (AESA) radars with sophisticated electronic attack capabilities, including false targets, network attack, advanced jamming and algorithm-packed data streams. This system allows the F-35 to reach well-defended targets and suppress enemy radars that threaten the F-35. In addition, the ASQ-239 system provides fully integrated radar warning, targeting support, and self-protection, to detect and defeat surface and airborne threats. But as you can see from the graphic above, first-ranked EW is not something new for BAE Systems. The F-22 and B-2 both rely on BAE capabilities. What you will hear very little about is the convergence of EW and cyber in the F-35 thanks to the Northrop Grumman-built AESA radar and the plane’s huge quantities of software, much of which is written by BAE Systems employees. In addition to the EW capabilities, BAE writes software for the fuel management system and other unspecified operating systems. "BAE Systems’ AN/ASQ 239 electronic warfare system for the F-35 is a fully integrated digital solution that provides offensive and defensive EW, radar warning, targeting support, and self-protection." ....if the ASQ-239 system; "All three variants of the F-35 carry active, electronically scanned array (AESA) radars with sophisticated electronic attack capabilities, including false targets, network attack, advanced jamming and algorithm-packed data streams. This system allows the F-35 to reach well-defended targets and suppress enemy radars that threaten the F-35. In addition, the ASQ-239 system provides fully integrated radar warning, targeting support, and self-protection, to detect and defeat surface and airborne threats." ...then the system would appear to be becoming complete for 3F (having met the scope of design)..
..and then there is that MADL/ comm. thingee and these missile/ bomb mules can become extended networking "eyes and ears"
You need a VLO airframe in order for the -239 to be effective enough to do the job. Remember that the radar (ie the only jammer element) only covers the front aspect. SpudmanWP wrote: You need a VLO airframe in order for the -239 to be effective enough to do the job. Remember that the radar (ie the only jammer element) only covers the front aspect. It sounds like the system is a broadband jammer, while the APG-81 focuses on X band fire control radars. SpudmanWP wrote: You need a VLO airframe in order for the -239 to be effective enough to do the job. Hmmm...this statement (from the quotes above) would appear to contradict that idea. The radar can provide stanoff x-band jamming using the APG-81 as the radiating element. However, it's only in the aspect that is covered by the AESA antenna. It can achieve this 10x efficiency through two methods, large radiating power (ie large antenna) and being able to focus the radiated power over long distances (ie AESA antenna). Both of those are limited to the forward sector of the F-35 and no, the -239 does not radiate any other kind of jamming signal other than the APG-81 based signals. In case I was not clear enough, I was trying to say that an F-16 with an APG-81 & a -239 could not penetrate & survive in the same missions that the F-35 can. The VLO airframe is too central to its survival. SpudmanWP wrote: Both of those are limited to the forward sector of the F-35 and no, the -239 does not radiate any other kind of jamming signal other than the APG-81 based signals. I'm nitpicking and assume that the ALE 70 has jamming capability but limited to defending it's host F-35. SpudmanWP wrote: Both of those are limited to the forward sector of the F-35 and no, the -239 does not radiate any other kind of jamming signal other than the APG-81 based signals..
SpudmanWP wrote: In case I was not clear enough, I was trying to say that an F-16 with an APG-81 & a -239 could not penetrate & survive in the same missions that the F-35 can. The VLO airframe is too central to its survival. This i agree , the synergy between jamming and low radar cross section is unquestionable. On the "Simultaneous jamming without interfering with radar"... it's because of the radar's AESA functionality that it can quickly switch back and forth without loosing capability. Where did that pic come from, brochure or article? It looks like the USN did put a contract out in April 2014 that has caused some confusion. BAE Systems Electronic Solutions, Nashua, N.H., is being awarded a $47,352,248 indefinite-delivery/indefinite-quantity delivery order contract for the manufacture of the transmitter countermeasures T-1687A/ALE-70 (V) in support of the Joint Strike Fighter program. Work will be performed at Nashua, N.H., and work is expected to be completed by April 2017. Fiscal 2014 procurement of ammunition Navy and Marine Corps, and fiscal 2012 Air Force aircraft funding in the amount of $14,314,816 will be obligated at the time of award. The Air Force funds in the amount of $6,308,224 will expire at the end of the current fiscal year. This contract was not competitively procured in accordance with 10 U.S.C. 2304 (c)(l). The NAVSUP Weapon Systems Support, Mechanicsburg, Pa., is the contracting activity (N00104-14-D-K054). I was wrong about the ALE-70.... the program is buying 318 of them in FY2017 and has been buying them for yeays (search the budget docs for "ALE-70" and you will see them going back to 2014. The ALE-70 Towed Decoy is a countermeasures dispenser system designed to fit into the F-35 Joint Strike Fighter (JSF) aircraft. The ALE-70 provides aircraft self-protection against radar guided missiles. Funds procure all system components: decoys, canisters, and explosive cartridges to deploy the decoys. 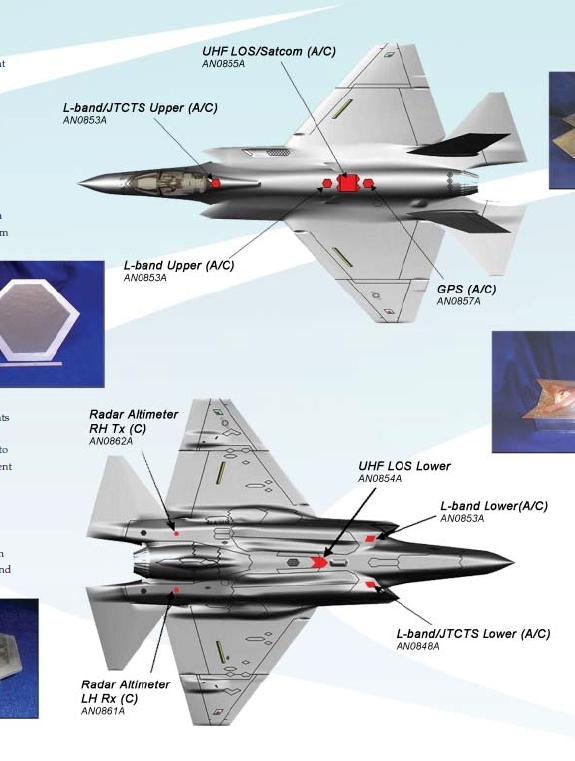 unique countermeasures, MJU-61 and MJU-64 are also used for F-35 self-protection. (14) ALE-70 FY 2015 quantities increased from PB 2016 to accommodate F-35B IOC. FY 2017 quantity change from PB 2016 due to revised F-35B delivery schedule. SpudmanWP wrote: On the "Simultaneous jamming without interfering with radar"... it's because of the radar's AESA functionality that it can quickly switch back and forth without loosing capability. SpudmanWP wrote: Where did that pic come from, brochure or article? There was a pic of a magazine interview with a BAE rep that I saw a few years back (but is saved on a PC that died). It stated that the aperture bays have room for active components "should the customer request their development". The -239 uses the APG-81 because it's freaking huge compared to traditional self-protection jammers. It's ability to put EW energy on target will only be surpassed by NGJ, and even then not the same power but it will have a later FOV and more bands that are covered. btw, Now that we know it has the ALE... where is it deployed from? Given its length and that all the F-35's doors that can open in flight are easy to ID.... Where the heck is it? We know that the flares are from the rear, right so I thought maybe rear-left... till I realised that area was taken up by the IPP exhaust for the F-35B which we know has the ALE. SpudmanWP wrote: The -239 uses the APG-81 because it's freaking huge compared to traditional self-protection jammers. It's ability to put EW energy on target will only be surpassed by NGJ, and even then not the same power but it will have a later FOV and more bands that are covered. SpudmanWP wrote: btw, Now that we know it has the ALE... where is it deployed from? Given its length and that all the F-35's doors that can open in flight are easy to ID.... Where the heck is it? May be from the top door , behind the refuel door ? Last edited by SpudmanWP on 17 Oct 2016, 18:18, edited 1 time in total.